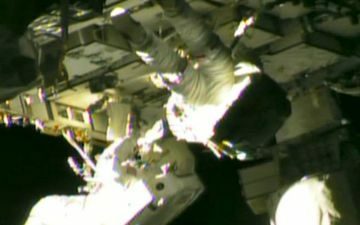 HOUSTON, Texas -- NASA says that Expedition 35 Flight Engineers Chris Cassidy and Tom Marshburn completed a spacewalk at 2:14 p.m. EDT Saturday to inspect and replace a pump controller box on the International Space Station’s far port truss (P6) leaking ammonia coolant. The pair began the 5-hour, 30-minute spacewalk at 8:44 a.m.
A little more than 2 1/2 hours into the spacewalk, Cassidy and Marshburn removed the 260-pound pump controller box from the P6 truss and replaced it with a spare that had been stowed nearby on the port-side truss, or backbone of the station. Mission Control in Houston, Texas ran the new pump while the spacewalkers watched for any ammonia snowflakes, but so far there have been no new signs of a leak. Long-term monitoring of the pump will be required to determine whether the pump replacement has fixed the leak.